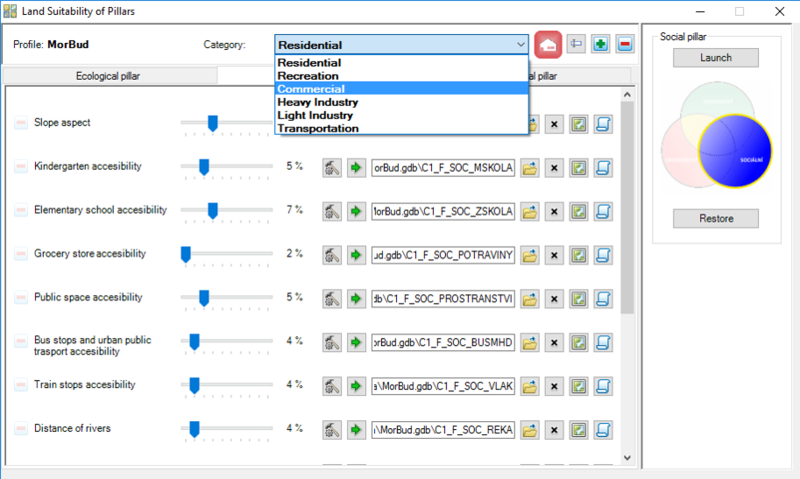 Urban Planner is an analytic extension for Esri ArcGIS for Desktop designed to evaluate the land suitability and to detect the most suitable areas for spatial development. The extension uses a multi-criteria analysis, respects the principles of sustainable development and allows to create several land use and land suitability scenarios. From the methodical point of view, the extension is partly based on What If ?, LADSS and LUCIS model. Emphasis is put on urban practice in Central Europe, but main princeples of extension are valid all over the world. The core of the extension focuses on the evaluation of land suitability according to input data, it’s values and weights. 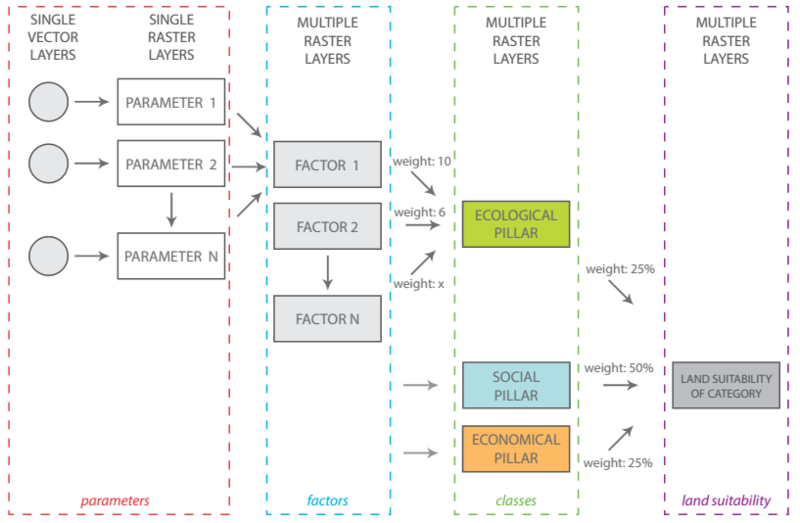 Land suitability is analyzed in three levels (pillars, factors, and layers) for the following six preset categories of land use. Housing/Residential – smaller areas used mainly for housing purposes ore mixed residential areas with services of local importance. Recreation – areas used mainly for recreation (holiday houses, cottages) usually limited by height limits. Commercial/Public Services – larger areas used mainly for commercial public services – administrative centers, larger retail areas, entertainment centers, exhibit centers, mostly with hight transport demands. Heavy Industry – larger production areas of heavy industry with potential negative influence on the landscape and healthy lifestyle, usually with protection zone. Light Industry and Warehousing – production areas of light industry and warehousing without production activities with negative influence on landscape. If negative aspects exist, their influence is limited only to the area of activity. Transportation – areas for transportation. Beyond these categories, the user can set a custom category or edit selected categories. The total land suitability is calculated according to the setting of the weights between the three classes (the three pillars): ecological, social, economical. Weight can acquire values from 0 to 100, the sum of the weights of all three pillars must be equal to 100. 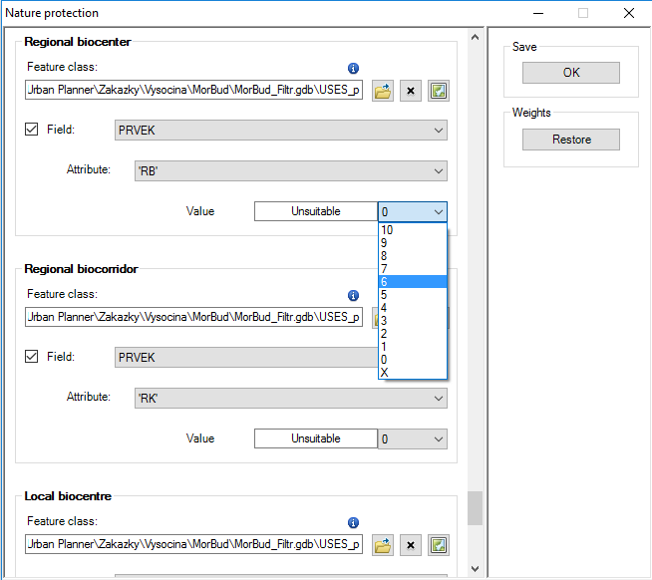 Extension allows the user to select from the preset options, or set your own.By different weights settings, it is possible to create several scenarios od land suitability. Each of the three pillars (classes) consists of factors. Factors can be divided into three groups – positive, negative and limits. Positive factors increase the value of land suitability, negative factor decrease this value, and the limits eliminate the value of land suitability. In some special cases, the limits determine the purpose, method, borders and the conditions of land use. As in the case of a pillars the combination of factors is based on weighted overlay method. The most detailed level of settings are parameters that can described as properties of factors. 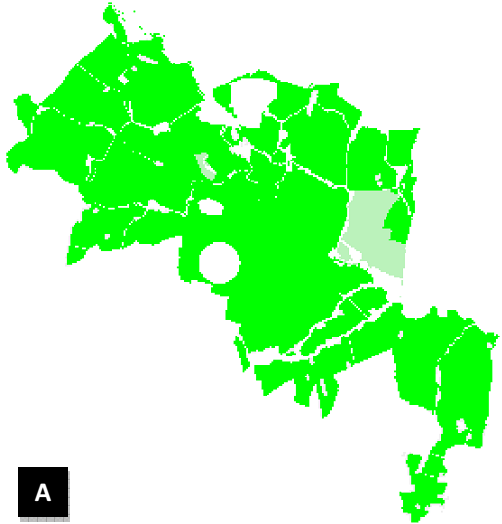 They are represented by specific layers (shapefiles) and their attributes. Factors’ weights can be set up in the range of scales 0-10. From a technical perspective, the most of the calculations are based on weighted raster overlay. The results of this part of the model are raster layers of land suitability. The second part of the methodology is designed to identify areas suitable for optimal allocation (optimal land use). Cadastral map (parcel units) can be used for allocation process, but due to spatial variability of land suitability in one parcel is recommended to use more regular units (hexagonal grid covering the studied area). It is possible to exclude build-up areas and non-buildable areas from the calculation. Each category of land suitability (housing, industry, recreation, etc.) has to be evaluated individually. The main variables that affect the allocation are the total area of allocation and the minimum area of allocation. The allocation process is performed by the following procedure. The whole area is covered by hexagonal vector network, the built-up areas are eliminated. By using zonal statistics, the average value of the land suitability is calculated for every hexagonal unit. One percent of units with the highest value of land suitability are selected and combined into contiguous areas. If the conditions of minimum and total allocated area are fulfilled, the calculation is done. If the conditions are not fulfilled, the process of units selections is repeated (2 % of units with the highest value of land suitability are selected). Urban Planner is released as ArcGIS for Desktop plugin (Add-In). For full functionality ArcGIS for Desktop Basic license and Spatial Analyst extension is needed. The extension requires .NET Framework version 3.5 or higher. The main extension toolbar is divided into four main sections (Land Suitability, Land Use, Data Manager and Settings). Land suitability component offers two sub-sections: Pillar Suitability and Land Suitability. Land suitability can not be calculated without previous partial calculations of pillar suitability.Land Use component also contains two sub-sections: Suitability Transfer and Allocation, which must also be run sequentially. Basic settings are used to define the main inputs used across applications in all calculations. All settings are stored in profiles which can be run repeatedly. All setting are stored automatically in the database connected with the current mxd project and can be exported or imported. This functionality can be used in case of multiple users or different scenarios. Profiles can be added, deleted or modified. 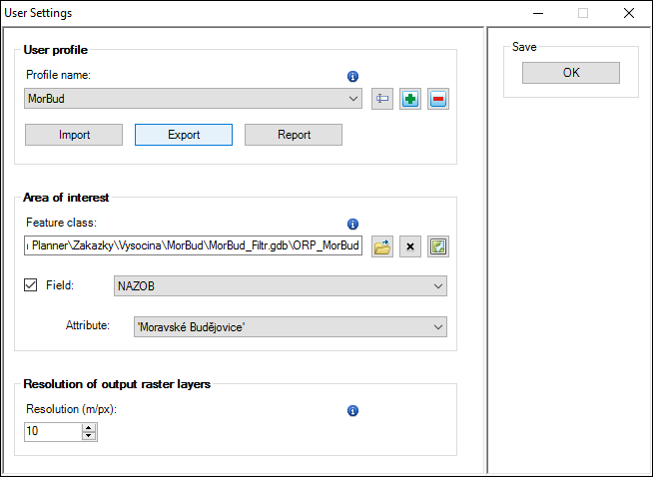 In the settings window is necessary to set up the area border, directory for analysis outputs and resolution of the output rasters. Especially raster resolution has to be set up according to the total area and according to the computational capacity of the computer (CPU and memory). Recommended resolution is 10 m. All outputs are stored in the database which is created automatically. In the case of Czech data of planning analytical material, the Data Manager can be used for automatic data import. In all other cases, the paths to all single layers have to be set up manually for all factors. If the user has it’s own data model, the application can be modified, and automatic data import can work too. Land suitability analysis consists of two sub-parts. First of all is necessary to calculate the land suitability of pillars (environmental, economic and social). Also, the category of land use (residential, recreational, commercial, industrial or transportation) for which land suitability is calculated has to be selected. These categories can be deleted, and new categories can be set up by the user. For each pillar is necessary to choose, what factors will enter into the calculation and what will be their weights. Default factors and their weights were calculated using the Saaty method by several experts. According to the specific conditions of the territory is possible to change the factor’s weights. Factors can be deleted or added, and there is no condition concerning a number of factors in each pillar. For each factor, it is necessary to check the settings for parameters which describes all factors. 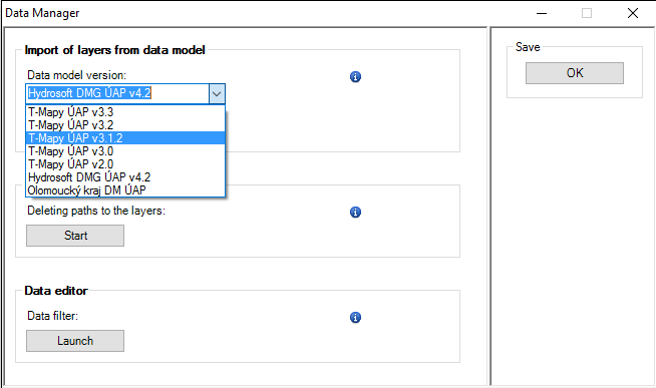 Each factor is composed of several sub-layers, where it is necessary to set the path to the input data (possibly also choose a field attribute), and then specify the settings (values). If the user always uses the same data model, Urban Planner can be modified, and paths to the data can be uploaded automatically. The parameters and weights for all layers are already set, the user can change them in scale from the excluded potential (NODATA value) through inappropriate potential (value 0) to the optimum potential (value 10). There are two types of data: ordinal and interval. For ordinal data, the weight is assigned to the whole phenomenon, for interval data the weights (0-10) are divided in all range of values (.eg. gradients, distances). Each pillar must be run separately by using Start button in the upper-right part of the window analysis. The user is informed about analysis results in a new window. After completing the calculation output, raster layers is loaded into ArcMap environment, and the path to the output layer is set up in the analysis window. After the calculation of all three pillars, the total land suitability has to be calculated. If the previous calculations were correct, the path of each raster layer is set up automatically. Alternatively, they can be selected manually. The key step during total land suitability calculation is the selection of predefined scenarios of development. Several scenarios are predefined, user values can be set up too. The final output of Land suitability calculation is raster layer of land suitability for the selected category according to the selected scenario development. For calculation of the other categories, it is necessary to repeat all the steps described above. For calculation of different scenarios, it is sufficient to repeat only the final step of the analysis. During all calculations, many raster layers are created. Therefore, all outputs are named according to predefined abbreviations that are described in the extension manual. The second component Land use allows to search (allocate) areas suitable for development on the basis of the previous total land suitability calculation. Raster the layer of total land suitability and layer of the non-buildable area (usually the same like built-up area) are the input layers. The most significant input values are the minimum size of the allocated area, which defines the minimum allowed size of areas intended for allocation and then the total allocated are. The result of the analysis is a vector layer showing areas with the highest value of land suitability for selected category of land use with regard to the total and minimal area of allocation. The second part of this component allows transferring values (average value) of land suitability to allocated units. Not only total the value of land suitability, but also values of pillars and factors can be transferred. New vector layer with allocation or any other vector layer (cadastral map or districts) can be used for suitability transfer. The outputs of the components Land Suitability Analysis are mainly raster layer showing the potential of individual factors, the potential of the three pillars (A) and the total land suitability (B) for selected category of land use. These raster layers can be used for verification of existing or planned activities. The final analysis (calculation of the total land suitability) can be calculated in several variants (scenarios), which can be compared and evaluated. This type of analysis may be used for comparison of possible variants of land development. 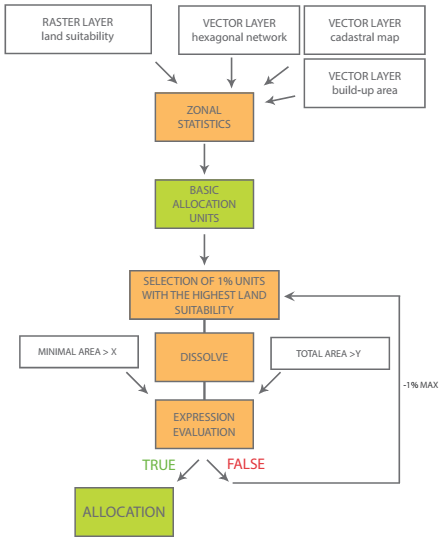 The outputs of the second component (Land Use) are primarily vector layers (C, D) that show the total suitability shown in the polygon layer (the basic allocation unit) and the final areas suitable for allocation. If a vector layer polygon units used eg. Layer municipal boundaries, basic settlement units, boroughs, etc.., The total suitability can be easily recalculated for different polygon units (municipalities, district, basic settlement units, etc.) as the average value. Each category of land use is calculated separately and can therefore cause overlapping of allocated space. This fact must be taken into account by expert estimate, or by integration in the input data. Urban Planner has great potential for use in all planning processes. First of all, can be used as a comprehensive tool to evaluate the land suitability and main principles of sustainable development. Result “Scenarios of sustainable development” can verify if current or proposed activities correspond to the areas with the highest land suitability. 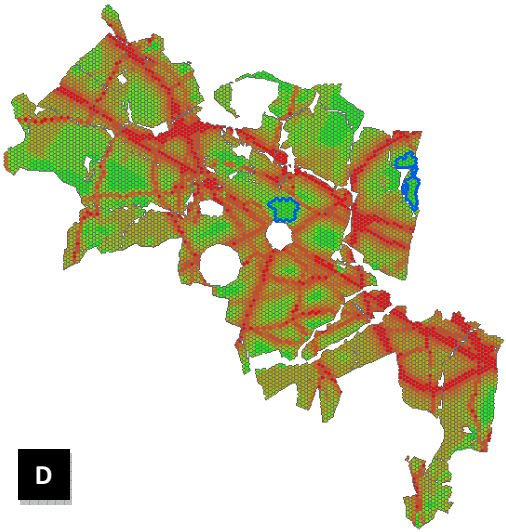 Based on the similarities and differences is possible to determine what factors were omitted during urban plan creation and what should be improved.Overall it is possible to create six scenarios used in the scenario modeling and many others according to user settings. With this analysis, the user can determine which scenario has the highest potential in the chosen location. The outputs from the second component can be used to detect areas with the highest land suitability for the selected category of land use. These areas can be searched according to defined parameters (minimum area of allocation a total area of allocation) by using “Allocation tool” and can be used especially when searching for the optimal development areas. 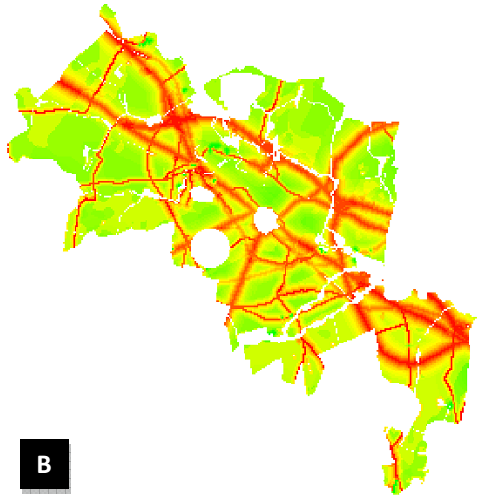 BURIAN, J., ŠŤASTNÝ, S., BRUS, J., PECHANEC, V., VOŽENÍLEK, V. (2015): Urban Planner: model for optimal land use scenario modelling, Geografie, 120, No. 3, pp. 330–353. Based on customer’s agreement, email technical support is provided. All questions concerning Urban Planner, please direct to info@urbanplanner.cz. The essential settings which influence all analysis results is raster resolution (the size of one pixel). It is necessary to set it according to the computational capacity of the computer, according to the total area size and according to the particular analysis purpose. It is recommended to work with more detailed grid (about 10 m / pixel). Users are advised to test the performance of the calculation for one sub-analysis and according to the speed adjust the input resolution value. Parameters of the layer considered as the limits have to be set very carefully. If the layer is hard limit eliminating any activity in the area, it is recommended to set its value to “NoData” (excluded land suitability). If the layer is the soft limit which only reduces the activity in the area, it is recommended to set its value to a higher value (starting from 1 to the higher values). If any parameter of the layer within the selected factor is set to “NoData”, the land suitability in this location will be excluded, and no other layers (even those with the highest land suitability) will affect total land suitability. 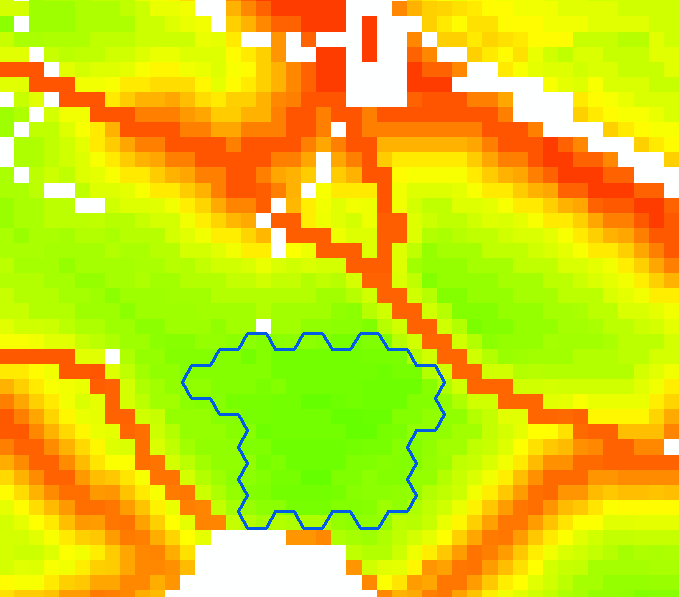 If any parameter of the layer within the selected factor is set to 0, the land suitability is inappropriate in this location (0 value), but other layers can increase total land suitability in this place.